Sarah Miller and Grace Funk warmly invite you to a Melbourne womens circle in 2018. As women we practice the ancient tradition of coming together to support, nurture and hold one another in sacred space. This is a Red Tent experience, honouring the mysteries of the feminine, of the cycles and our body’s sacred intelligence. No circles in July and August – we rest in Winter! The emphasis of these circles will be on rest, connection and deep listening. Always there’ll be a spaciousness to show up exactly as you are, and for ‘participation’ to look different for each woman. Trans women are welcome. You can come to one, a few or all of the circles. The more we gather together, the deeper we weave connection and safety, and therefore healing and wholeness, for ourselves and all our relations! Circles will commence at 7.30 and run for 2 hours. 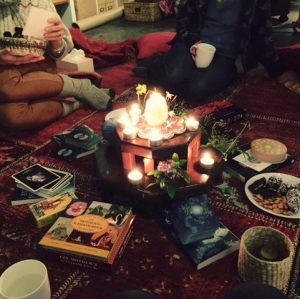 All circles will be held at El Camino Wellness Centre, 102 Grange Rd, Glenhuntly, except for our November circle, which will be held at Sarah’s house – address supplied upon booking. Get in touch with any inquiries.